Karl Marx’s Capital is one of the most important texts of modern social thought. Its three volumes (1867-1883) set out his theory of capitalism, specifying how capitalism works and providing important insights into its historical dimensions. These insights have shaped left politics for over 150 years. 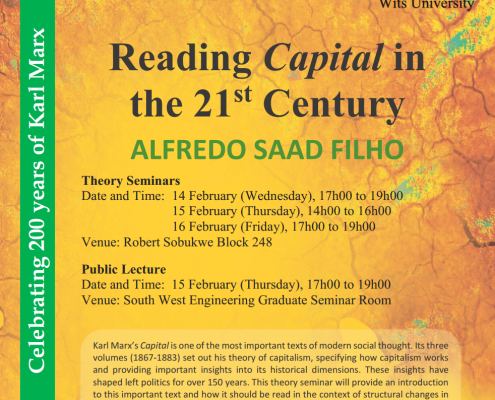 This theory seminar will provide an introduction to this important text and how it should be read in the context of structural changes in capitalism, deepening crises and the need for alternatives. Engaging Capital as a theoretical resource is crucial for our times. Leading our theory seminars and providing a public lecture will be Brazilian Marxist and political economist, Professor Alfredo Saad Filho. 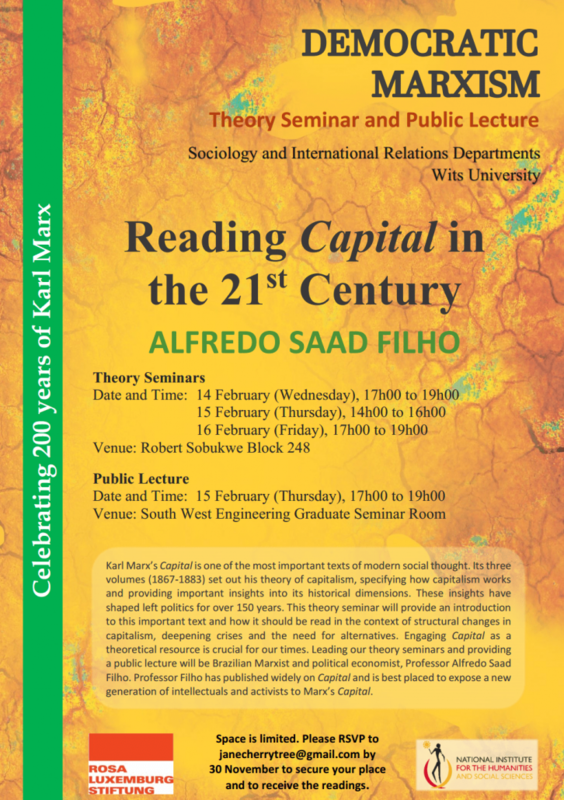 Professor Filho has published widely on Capital and is best placed to expose a new generation of intellectuals and activists to Marx’s Capital. 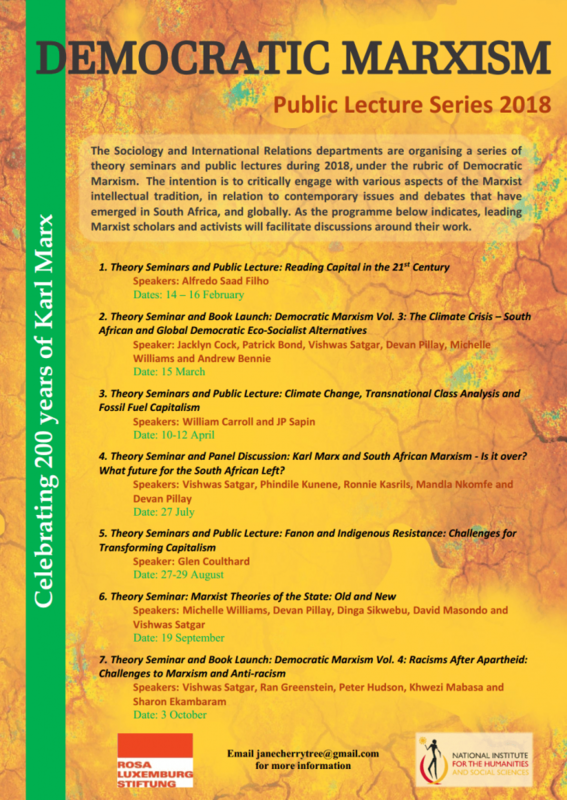 During 2018 we will be celebrating 200 years of Karl Marx with some great thematic focuses, panel debates, book launches and public lectures. 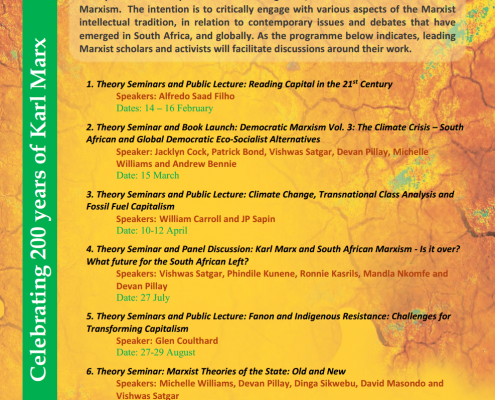 These events will cover reading Capital in the 21st century, the climate crisis, understanding fossil fuel capitalism, Marxism and the future of the South African Left, Fanon and Indigenous resistance, revisit Marxist theories of the state and discuss racisms after apartheid, intersectionality and more. See below the poster below for the full programme for 2018.